Smile Solutions is extremely proud to have been recognised as an ABA100 Winner for SERVICE EXCELLENCE in The Australian Business Awards 2017 – the sixth successive year in which we have been a winner in this category. In 2017 we were also honoured with the title of ABA100 Winner of the Australian Business Award for Community Contribution in recognition of our work with the Salvation Army’s Magpie Nest Foundation. The addition of these awards to our existing portfolio has cemented our practice as a pioneer and leader in Australia’s health industry. The Australian Business Awards engage with leading corporate, government and non-government organisations across key industry segments, assessing the full spectrum of business initiatives and product development undertaken by Australia’s leading organisations. The Australian Business Award for Community Contribution recognises organisations that implement initiatives that have a positive impact on the community and generate outcomes that have a long-term benefit. Smile Solutions, acting on its commitment to give back to the community, proudly donates up to $100,000 in dental services annually to Magpie Nest – a contribution it has offered each year since 2014. In doing so, we strive to improve recipients’ dental health and thus boost their self-esteem, ultimately raising their chances of gaining employment and creating positive long term effects for these individuals and the community. The Australian Business Award for Service Excellence recognises organisations that have achieved outstanding results through initiatives that demonstrate leadership and commitment to service excellence. Ever since Smile Solutions moved to the Manchester Unity Building in 2002, it has been our mission to provide our clients with the full range of dental services – of a high standard, at a competitive price and without requiring them to leave the building. Driven by this goal of providing our patients with outstanding service, we expanded our already extensive operation to include an onsite laboratory and an imaging center, thereby streamlining patient care and removing the need for patients to go elsewhere for behind-the-scenes services. In July 2014, Smile Solutions reached new heights when it was declared Victorian Business of the Year in the 2014 Telstra Australian Business Awards. We also took away the Medium Business Category Award. Since 1992, the annual Telstra Australian Business Awards have been celebrating the country’s entrepreneurs and innovators. Prestigious and coveted, they are a unique chance for small to medium businesses to be recognised for their hard work, commitment and success. The awards operate in every state and territory and are open to all Australian small- and medium-sized businesses across five award categories: Start-up, Micro, Small, Medium and Regional. Smile Solutions was pitted against the state winners in all 5 categories (Start-up, Micro, Small, Medium, and Regional). We are proud to have been judged the overall winner for the state. "Smile Solutions has created genuine points of difference – they became the dental practice that has multiple specialists under one roof in the heritage-listed Manchester Unity building. "The Telstra Awards Judges praised the business for its strong, year on year financial improvement over many years, its sustaining vision of growth and the founder’s staff retention mantra that leadership is about taking care of your clinicians and they in turn will take care of your customers." Smile Solutions was selected from hundreds of Victorian entrants to become one of 7 finalists in the medium-sized business category, then the eventual winner of this category. “Smile Solutions is Australia’s largest private dental practice in a single location. A private company, the business has grown from a one-dentist operation in 1993 to become a large-scale outfit employing over 90 people with a patient base of over 65,000. Their goal is to offer dental patients the best and most appropriate service possible in terms of technical excellence, comfort and convenience for the patient, clinical outcome and cost. “The core of Smile Solution’s business culture is collaboration combined with delegation. A unique organisational structure means that that specialists, general dentists and hygienists form part of the leadership team along with management, reception and nursing staff, enabling Smile Solutions to offer diverse career opportunities and growth. “Founder and managing director of Smile Solutions, Dr Kia Pajouhesh, is in constant face-to-face, telephone and email contact with his team in addition to holding weekly and monthly staff meetings. Training and mentoring along with peer and manager reviews encourages staff to be proactive in discussing their needs. A high degree of autonomy, peer recruitment, and morale building activities such as business funded snow trips, evening charity functions, annual celebrations and corporate box seats at AFL games, bring a fun element into the workplace and encourages strong interpersonal bonds that transcend roles and foster voluntary collaboration. The Australian Business Award for Service Excellence [SXA] recognises organisations that have achieved outstanding results through initiatives that demonstrate leadership and commitment to service excellence. “Smile Solutions is Australia’s largest private dental practice in a single location. A private company, the business has grown from a one-dentist operation in 1993 to become a large-scale outfit employing over 90 people with a patient base of over 65,000. “Smile Solutions is the only dental practice in Australia providing the service of Dental Board registered specialists in all fields of dentistry under the one roof in tandem with general dentistry. In addition to their core business in Melbourne’s CBD, in just one year Smile Solutions have expanded their network to include branches in six Melbourne metro and Greater Melbourne localities as part of the Core Dental Group initiative. The goal of this initiative is to offer dental patients the best and most appropriate service possible in terms of technical excellence, comfort and convenience for the patient, clinical outcomes and cost. “Smile Solutions strives to give patients access to world-class practitioners across the entire spectrum of general dentistry and specialisations, working with premium equipment and materials, in an architecturally beautiful setting. Core Dental Group takes these benefits and expands their geographic reach, making them accessible to more people in the community. The Australian Business Award for Innovation [INA] recognises leadership through the practical application of innovative solutions for new and existing market needs resulting in a commercial, environmental and/or social benefit. “Founder Kia Pajouhesh wanted to build a dental practice that was a magnet not only for the best clinicians and other staff but also for patients. This was achieved by underpinning the “One Team, One Place” business model with breathtaking architecture and interior design combined with the best available dental technologies in the world. “In 2014, Smile Solutions opened the Invisalign Shop, a uniquely dedicated Invisalign hub conveniently located in Melbourne’s central business district. Invisalign is a revolutionary orthodontic solution that is a near invisible alternative to unpopular metal braces. The design of the shop involves three zones including exterior, shopfront and back-of-shop. The shopfront zone is an informal reception area supported by three iPads that run the app-style, user-driven Invisalign website. The interface used is friendly and accessible, that most preliminary questions can be answered. In the rear zone, patients can receive a free assessment of their underlying general and dental health as well as their clinical suitability for teeth straightening. “The underlying innovation of Smile Solution’s practices is its ability to accommodate the clientele derived from three main areas: the acquisition of new patients seeking Invisalign treatment; the acquisition of new patients needing other general and/or specialised dental treatments and referrals from external dentists. The Australian Business Award for Service Excellence 2013 recognises organisations that have achieved outstanding results through initiatives that demonstrate leadership and commitment to service excellence. “The Australian Business Awards is delighted to recognise Smile Solutions as recipient of The Australian Business Award for Service Excellence in its industry classification for 2013. “Smile Solutions is Australia’s largest private dental practice in a single location. A private company, the business has grown from a one-dentist operation in 1993 to become a large-scale outfit engaging 90 people. “Smile Solutions is the only dental practice in Australia providing the services of Dental Board–registered specialists in multiple fields of dentistry under the one roof in tandem with general dentistry. The goal is to offer dental patients the best and most appropriate service possible – in terms of technical excellence, comfort and convenience for the patient, clinical outcome and cost. It really does offer ‘One Team, One Place’, which is attractive not only to patients but also to the best clinicians. 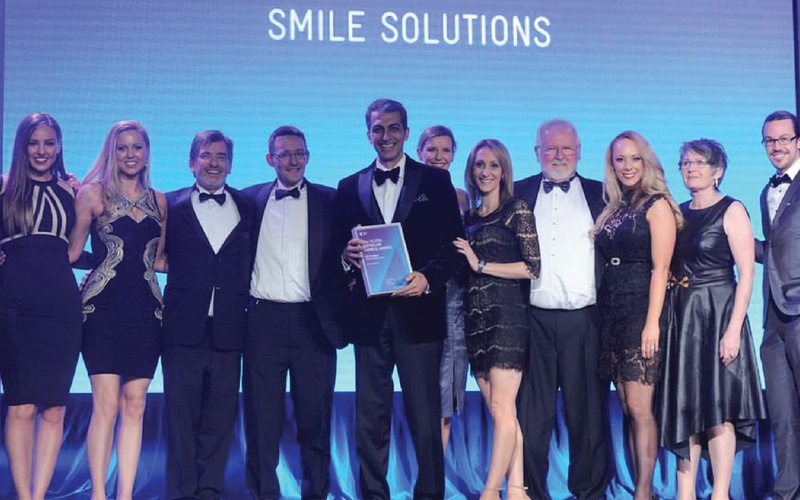 “The Australian Business Awards congratulate Smile Solutions for its success in the category of Service Excellence in 2013. “The Australian Business Awards is delighted to recognise Smile Solutions as recipient of The Australian Business Award for Innovation in its industry classification for 2013. “Smile Solutions is Australia’s largest private dental practice in a single location. A private company, the business has grown from a one-dentist operation in 1993 to become a large scale outfit engaging 90 people. “Smile Solutions has broken new ground in Australian commerce by matchmaking an unlikely pair: an historic architectural icon, the Manchester Unity Building, with 21st century technological sophistication. The goal was to build a dental practice that married form with function, and to offer dental patients the best and most appealing service possible – in terms of comfort and convenience for the patient, technical excellence, clinical outcome and cost. “The Australian Business Awards congratulate Smile Solutions for its success in the category of Innovation in 2013. The Australian Business Award for Service Excellence 2012 recognises organisations that deliver outstanding customer service. “The Australian Business Awards are delighted to recognise Smile Solutions as recipient of The Australian Business Award for Service Excellence in its industry classification for 2012. “Smile Solutions is a prominent Australian private dental practice ... Occupying 1800 square metres of floor space across three floors and the tower of the iconic Manchester Unity Building, on Collins Street, Melbourne, the company’s total revenue has increased at an average rate of at least 25 per cent per annum over 17 years. It runs 18 operatory suites, with plans to expand to 25; provides the equivalent of 108 days of clinical dentistry every week; and acquires approximately 600 new patients per month – 300 via word of mouth, 300 via marketing. “Using the resources, knowledge and experience of [multiple] general dentists, board-registered dental specialists, hygienists/therapists, dental assistants and administrative staff, Smile Solutions offers unparalleled dental services to the public. “Collectively, the team of registered specialists offers the full spectrum of dental care, from basic treatments through to specialised cosmetic and surgical dentistry, to meet the needs and expectations of their vast patient base. Registered specialists include orthodontists, an oral & maxillofacial surgeon, endodontists, prosthodontists and paediatric dentists. “The company’s extended weekday and weekend operating hours offer flexibility to CBD workers and convenience to hotel guests in need of urgent, quality-assured, dental treatment during their travels. After-hours emergency services are also provided.